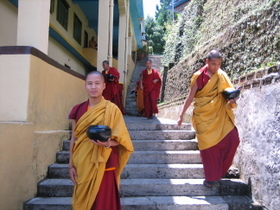 Rumtek monastery is the largest and one of the most important Buddhist monasteries in Sikkim. 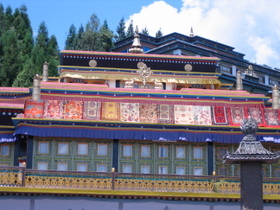 It was initially built in 1740 and was reconstructed in 1959 by the spiritual guru of a Buddhist sect who was on exile from Tibet. I stopped here on my way to Gangtok from Darjeeling. The monastery is about 26 kms from Gagtok and is a must see if you are in the area. 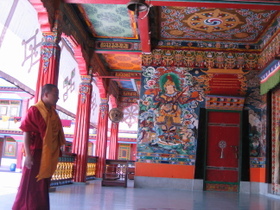 The monastery is housed in a beautiful building with ornate carvings and pictures. 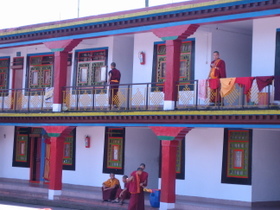 Buddhist student monks study and live in the dorms from age seven. They start their prayer lessons at 4 am in the morning and continue all day long with breaks in the middle. I had once contemplated living in a monastery for six months to explore my spiritual self. But I don't think I would survive here beyond a week. There is just too much studying involved here..